You are on the cusp of understanding: your mind has begun to comprehend what the heart and spirit knows. Remember your intentions regarding fulfillment — this new understanding is a support toward those ends. In order to move forward some things must be abandoned; intuitively you know what those things are. Beyond the mundane challenges you face, there is a life lesson at hand. You are at center stage, all eyes are upon you, it is a moment to shine; and you are called to respond in an unexpected way, a way that may not at first be obvious. The path is clear when you ride the right horse: proceed calmly, with heart open and intuition fully engaged. Casting notes. 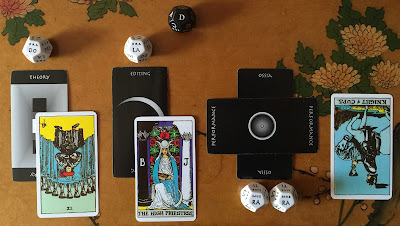 Under do descending, the point of inception, we find Theory; in the same position, we find the Nine of Cups moving upward from the point of intention. Under la descending, the point of governance, we find Editing in conjunction with the High Priestess. The axis of the casting is over ra ascending, the point of broad challenge, of karmic debts and payments; here we find Performance crossed with Ossia, with the Knight of Cups descending from the point of vitality. Further subtleties. This casting is in the key of D descending, and so resonates in the body primarily at the second chakra, the seat of creativity. The burgeoning understanding at position 1 seems miles away from the karmic call at position 3: they are separated by a major seventh, which is a long way. The culling at position 2 fills the hole. That culling is somber business in relation to this new understanding — positions 1 and 2 are separated by a minor third. Finally, there is a longing urgency between the culling at 2 and the karma at 3, as they are separated by a minor sixth. Musically, though based in the key of D, this casting feels very much in the key of G; this “future is now” aspect reinforces the “already underway” qualities of position 1. It also brings the throat chakra into play, which resonates with Performance. The sweetness of the harmony at position 2 suggests that the culling at hand may include a sense of relief.